Do you want to work with nature on your homestead but don’t know how? And really, what does that even mean? How do you work with nature in your garden? What about the rest of your property? The key is to make nature your partner by rewilding your homestead. Rewilding your homestead is at the core of what it means to be a wild homesteader. Historically, homesteading was about going into the perceived wilderness and carving out a life for you and your family. Nature was not seen as a partner, but as something to overcome. Wild Homesteading takes a different approach. Instead, the focus is on bringing the wild back to the homestead by rewilding the land in a true partnership with nature. But rewilding your homestead does not mean you stop growing your own food and return to hunting and gathering. Even a suburban homestead can be rewild—in fact, I wish every suburban house would rewild their yard! Rewilding your homestead means that you create habitat for birds, bugs, and other critters to help get pests under control and restore balance. It means building soil and working with soil life like fungi to create dark, rich soil. It also means working with the land to hold as much water as possible using methods that rehydrate the land and enhance the flow of water to keep your plants happy and healthy. When you rewild your homestead, nature is not an obstacle but an accomplice in the beautiful quest of cultivating abundance. Are you convinced to start rewilding your homestead? 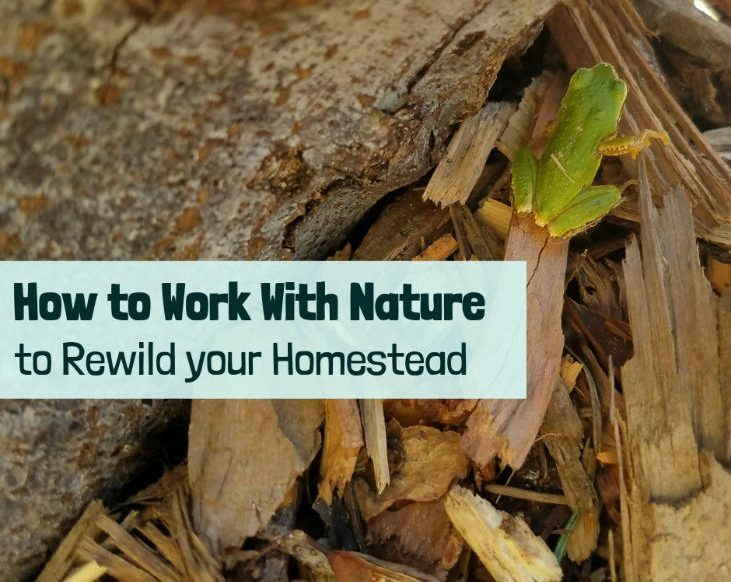 This post will walk you through the many reasons working with nature will boost your homestead and then dive into practical actions that will help you rewild your homestead. If you’re already convinced and you just want to get started, then grab our companion worksheet for 5 steps you can take to start rewilding your homestead today. Here you can see my in-progress food forest with multiple rewilding features. There over a dozen different species of native plants, multiple snags, logs, rock piles, mulch and a bird bath in this food forest. As a homesteader or gardener, you are more closely connected to the land than the average person. You care about when the rains come, you notice the coming and goings of wildlife, you see where water collects and what areas get dry first. You observe the land and make connections with it every day. But what happens next? Do you use those observations to work with nature? Or do you sigh in frustration as you deal with pests or grab the watering can? Does it seem like it’s always you against the natural world? Rewilding your homestead is about taking a different path, where you use your observations to make changes to your landscape and work with nature instead of fighting against it. Of course, it’s not quite that clear-cut. Rewilding your homestead means blurring the edges a bit. Just as everything in nature is interconnected, a truly wild homestead builds a system that is also fully interconnected. The flow of water aids in soil creation, and soil creation aids in the flow of water. Water and soil improvements both support wildlife, which further enriches the overall system through their actions. All parts of a wild homestead work together to create an overall state of abundance. I share a dirt road with several neighbors that collects a fair bit of water. I put in a channel that takes water from the road and diverts it into a mulch basin and then out into my homestead. This simple feature diverts a significant amount of water to my homestead. Water is life. How often have you heard that? Well, it turns out that there’s a lot of truth to that statement. But too often, land management approaches aim to drain the water off the land as soon as possible, only to turn around and use irrigation to rehydrate the land where and when we want it. In cities, we pave roads, sidewalks, and even great expanses of parks. In town and country alike, we move mountains to level our landscapes, forcing water into storm drains, culverts, or narrow channels, and choking off the life that once thrived by its side. Gone is the meandering stream of the past. Today, we manage our landscapes so water can run off somewhere else—so it can run away. (Until, of course, we pay to channel it back in.) It’s almost as if we impose our own high-speed mania onto our waterways, as if at any given moment, the highest aim of the water in a river was to rush just downstream as quickly as possible. When it comes to growing food, too often we’re caught in a difficult balancing act, trying to find the sweet spot between soils that are either waterlogged or dried out. But with the right systems in place, natural landscapes are actually really good at storing water and using it to nurture life as it’s needed, without flooding out life along the way. What if, instead of forcing water into the runoff racetrack, we worked with the land to manage the flow of water through it and over it? Imagine creating large water catchment features like swales to hold water in place—not just in the countryside but even in the suburbs. This would slow down the water and spread it out, allowing it to sink into the landscape. Once in the ground, the water will rehydrate the land, supporting an abundance of life, including your garden and crops. When water has the opportunity to sink in, that’s when it really works its life-giving wonders. Ground water moves through the landscape far slower than surface water. Instead of racing downstream, it lingers beneath the surface, making itself available to your plants well into the dry summers. What if water catchment was done across vast stretches of land? The result would be a rehydrated landscape much more resilient to drought and fire. But even if your neighbors don’t join you, there’s still a lot you can do to rehydrate your own land. Rewilding your homestead is about working with nature to improve the flow of water. But don’t worry if a swale or pond seems out of reach. There’s a lot you can do to increase the water-holding capacity of the soil by building rich organic soil that your plants will love. Here you can see a new part of my in-progress food forest. Soil is being built by sheet-mulching using cardboard, wood chips and fall leaves. There is also a native hazelnut and a large log which are both also helping to rewild this part of my homestead. Everything in nature is interconnected, and the relationship between water and soil is a prime example. Water can erode soils, but it can also build them. The floodplains of rivers are some of the most productive landscapes for farming. This is because of the soil dropped off by the flood waters. And it also works the other way around—soil can improve the flow of water. As you rewild your homestead, one of your goals should be to build your soil, and specifically, to increase the percentage of organic material in the soil. I’m talking about all those pieces of dead plants, bugs and critters, plus the millions of microbes, fungal networks, and bacteria that thrive in healthy soil. When the soil is full of life and dead organic material, it can hold truly amazing amounts of water. Over an acre, every 1% of organic material can hold as much as 25,000 gallons of water! Imagine what happens if you go from 1% to 5% organic material in the soil (the percentage of the soil made up of organic material). The soil would go from holding 25,000 gallons of water in an acre to 125,000 gallons in that same acre! That’s as much as about 2,273 of those 55-gallon blue rainwater barrels that people like to use! But unlike the barrels, building soil will also support the soil life and provide nutrients that your plants need to thrive. This can be achieved by working with nature by leaving the soil in place instead of tilling it, by planting perennials such as trees, shrubs, and even perennial vegetables, and by using mulch. As you rewild your homestead, you will see your soil steadily improve, which will in turn provide numerous spillover benefits across your wild homestead. The more I have done to rewild my homestead the more I have seen wildlife like this small frog. In turn the wildlife help to keep my homestead in balance resulting in minimal pest problems. While building soil and improving water flow are part of rewilding your homestead, it won’t truly be a wild homestead without wildlife. By wildlife, I’m talking about everything from tiny bugs, bees, or even microscopic mites, to larger animals like birds and mammals. Wildlife provides numerous benefits to a wild homestead. A thriving wildlife community keeps pests in balance, ensures a healthy population of pollinators, and enriches your soils with an ongoing supply of nutrients. A healthy landscape is teeming life of all shapes, sizes, and behaviors. But in our managed landscapes, biodiversity is often choked out by monocultures—like grass in the cities, or vast fields of corn, wheat, apple trees, etc. in rural areas—plus all the toxic chemicals we use to maintain them. Instead of an Eden of biodiversity, we’re left with the paltry few critters that can survive on such a limited diet. Is it any wonder that many of them can’t seem to get enough of our garden vegetables? By creating habitat for wildlife instead of trying to fight pests with chemicals, your wild homestead will start to support a population of the predators that eat those pests. A balance will emerge. You will still see some pest damage, but it will be a lot less common. Wildlife also provide nutrients such as phosphorus and nitrogen through their droppings as well as when they die and decompose. Don’t worry—most are so small you won’t even notice—but it all adds up to make a big improvement to your homestead. While I’m a big believer in bringing wildlife onto your homestead, there are exceptions. In my area, deer are one of them. There are no longer enough predators—no matter how much habitat I create on my homestead—to keep deer in check. Restoring the predator-prey balance is beyond the scope of a single homestead in this case. If there is a pest that no longer has predators, then you may need to take additional actions. In my case, that meant putting up a deer fence. But I also put in tunnels at the base of the fence. The deer are too big to use them, but coyotes and other smaller animals can come and go as they please. I want the coyotes to come in, because they eat the voles that would otherwise cause problems on my homestead. Whenever possible, balance is best. But sometimes exclusion is the only viable option—as in the case of deer in my area. I'm always on the look out for new rewilding features to add to my homestead. I found this snag in a forest that will soon be developed. If the forest was not going to be developed I would not have taken the snag but in this case it would have been destroyed in a few months anyways. This snag was added to my wild homestead. The benefits of rewilding your homestead are immense, but it can also be a daunting project to take on. Where do you start? How do you take land that is not wild and bring the wild back, while at the same time also producing an abundance of food for you and your family? It helps to break it into manageable pieces and start small. Here are the techniques I’m using to work with nature and rewild my own homestead. These techniques can work for the rural or urban homestead. Small rock piles like this one are great for wildlife such as that frog I shared earlier. Creating features like this provide shelter for wildlife which will help to create a balance on your homestead. As you rewild your homestead, you’ll want to include features that create habitat for wildlife. Unless you have a large (20+ acres) homestead, this will mostly mean birds, bugs, lizards, snakes, and small mammals. Planting native plants is probably the best thing you can do. There are numerous insects that depend on a single specific native plant. If all you have are non-native plants, then you’re not support the majority of plant-eating insects in your area, and instead just support the generalists, the virtual “omnivores” of the insect world. You also need to provide habitat features to provide hiding places for the wildlife. This can include brush and rock piles, snags (dead standing trees or “planted” logs), logs with or without roots lying on the ground, and a good mulch layer. Adding water features such as ponds and swales will also be very popular with local wildlife, but even a simple birdbath can provide a substantial benefit. Finally, planting a good number of trees and shrubs will provide excellent cover and habitat for wildlife. Make sure to include a few evergreen shrubs or trees for winter cover if you live in a temperate region. I'm slowly removing most of my grass by sheet-mulching. The result will be better soil filled with organic material which will hold far more water than the same area did before. Wood chips were added on top of the cardboard. Since building soil life is central to improving the flow of water on your homestead, these two go hand-in-hand. Building soil as you rewild your homestead may require a change in your normal gardening techniques. The biggest thing you can do to build soil on a wild homestead is to stop tilling the soil and start using mulch. Check out the blog post 6 Methods for Preparing Land for Planting for ideas on how to prepare land while also building soil. Another key method for building soil is to always cover bare ground with mulch or with a cover crop of plants. Mulch made from organic materials like wood chips or fall leaves will reduce how much watering your plants need and will slowly break down into great soil for your plants. Organic mulch will also support soil life, including fungi, which will help build soil and allow your plants to thrive. Another great method for building soil as you rewild your homestead is to use a practice called chop-and-drop. As you prune your plants or put the garden to bed, just chop the plant material up and drop it on the ground. The resulting plant material will provide the same benefits as mulch, resulting in less watering and richer soil. Another great way to quickly build soil by mimicking nature is to use a technique called hugelkultur. This techniques mimics what happens when a tree falls in the forest and becomes a nurse log with plants growing out of it. The result is a garden bed that requires little-to-no irrigation with deep, rich soil. All these methods will not only nurture your plants, but also improve the flow of water through your homestead by increasing how much water the soil can hold. A good next step is to consider building swales and ponds or other features with water to slow it down, spread it out, and let it sink in. Rewilding your homestead does not mean you stop having a garden, or fruit trees, or berry bushes. It simply means a change in your approach to these things. One change is to start including perennial vegetables in your garden and around your trees and shrubs. Unlike annuals or biennials, perennial vegetables will return year after year without needing to be replanted. While this alone saves you time and energy, perennials also require less watering than traditional vegetables like tomatoes. Perennial vegetables also help to build soil by reducing soil disturbance and supporting soil life. To learn more, check out these blog posts all about perennial vegetables. The ultimate way to grow food on a wild homestead is to start your own food forest or forest garden. A food forest works by mimicking the structure of a natural forest. This involves mixing fruit trees, support trees (nitrogen fixers or trees for chop-and-drop), edible shrubs, perennial vegetables and herbs, and annual vegetables together into a single system. The result is a highly productive food system that takes care of itself, just like a real forest. Amazingly, you could abandon it and it would still produce an abundance of food. You will also want to shift away from using chemicals to manage pests in your food-growing areas and instead work to create a balance between pests and the critters that eat them. The rewilding journey takes time but the results are well worth it. Your wild homestead will be filled with life and beauty. Wild Homesteading is all about cultivating abundance by working with nature rather than against it. Rewilding your homestead and garden will help you get there. The key to transforming your homestead into a wild homestead is to remember that nature is always your partner in this journey, not an obstacle to overcome. The techniques in this post will help you work with nature to build soil, hydrate your landscape, and grow your own food while supporting the local wildlife that will pollinate your crops and help keep your pests in check. There are many ways to rewild your homestead, but there’s no need to get overwhelmed. As a first step, pick one of the techniques explored here and try implementing it. Perhaps you could add habitat features like brush or rock piles scattered around your homestead. Next time you are pruning your plants, try practicing chop-and-drop. Instead of bagging up the cuttings, just leave them on the ground as mulch. Rewilding your homestead is a constant journey. To help you get started, we made a free and easy-to-print worksheet with five actions you can take TODAY to start working with nature to improve your garden and homestead. Keep at it, and before you know it, you’ll have wild abundance wherever you turn. Daron, love the title and concept. I’ve been working towards this for a few years and now, thanks to you, I have a name for it! So far, we’ve added ponds, terraces, hugel mounds, and rocks. Weve encouraged native edibles using chop and drop, mulching, seed spreading, and replanting where optimal. Weve used fallen trees to stabilize steep areas, to rebuild soil where optimal, and to mulch trees. Weve taken suckers and placed horizontally on slopes to catch leaves and slow afterglow. Weve added old firewood to creeks as check dams. And we’ve intentionally left BlackBerry brambles in thick patches to support bunny nesting habitat. Look forward to implementing snags soon. Thank you very much for your comment! Sounds like you have done a lot of great things on your property. From what you have shared your place sounds really awesome and a true wild homestead! 🙂 Best of luck to you and thank you for sharing!